Toshiba says new TV will turn 2-D signal into 3-D.
Las Vegas, Nevada (CNN) -- Toshiba on Wednesday unveiled a "smart" TV the company claims will convert 2-D signals into high-resolution 3-D programming. The ZX900 Series Cell TV models, available with 55-inch and 65-inch screens, will go on sale in the United States later this year. Pricing was not announced. Toshiba says the LED TV will have the capability to take any 2-D content, including sports broadcasts, movies and video games, and convert it into 3-D in real time. "It's unlike anything that's out there," said vice president of marketing Scott Ramirez during Toshiba's press event at the 2010 International Consumer Electronics Show. "This is the new 'it' TV. It's the one everyone is going to be talking about." 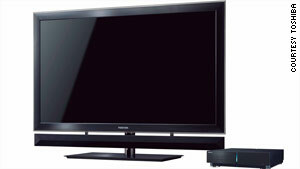 The TV's biggest strength is a multimedia processing chip previously used in advanced PCs and high-end gaming consoles. Toshiba claims its Cell TVs will have 143 times the processing power available in current TV models, although that boast was hard to immediately verify. With many manufacturers unveiling 3-D and "connected" TVs at CES this week, Toshiba will have stiff competition for the "it" TV title. Like many new or next-generation televisions, Cell TV will allow you to transfer media files from your PC onto the TV's hard drive so that you can display photos and home videos on its screen. The TV's Internet connection will offer access to streaming content from such partners as Netflix and Pandora. Finally, Cell TV will also work as a video phone, but with much higher picture quality than most simple webcams. "You're going to look crystal clear at 55 inches," said Ramirez. In other TV news from CES Wednesday, Sharp unveiled something it called "quad pixel" technology that it claims will change the way TV consumers see color. Sharp's new Aquos LED models add a fourth color -- yellow -- to the traditional red-blue-green trio of primary colors, which the company says will enable it to display more than a trillion different colors.